Note: Double bottom ballast tanks, 3 WT bulkheads, arch frames, channel system, 4 compartments, hatches on 24" centers. Engine 22, 35 & 58 x 40"; 1200 hp @ 85 rev; Cleveland, OH Shipbuilding Co. 13'2" x 11'6"; 165# scotch boilers, forced draft. 1898, Nov Maiden voyage Lorain, OH-Duluth, MN; 5,000 tons coal. 1899, Feb 10 Owned Pickands, Mather & Co., Cleveland. 1899, Spring Owned Pittsburgh Steamship Co.
1899, May 29 Collided with steamer ROUMANIA, Ashtabula, OH, Lake Erie. 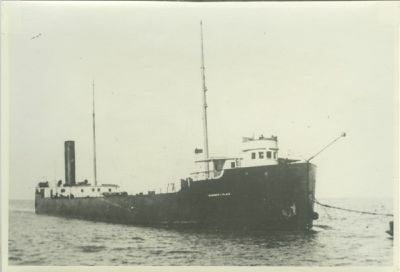 1904, Aug 12 Collided with propellers A. R. COLBORN & LILLIE, sank COLBORN, St. Clair Flats ship canal. 1922 Reconstructed, 4150 gross / 2555 net tons. 1942 Traded to US Maritime Administration but operated US Steel until war ended. 1945 Laid up Erie Bay.